Miniature optical systems required for digital endoscopes present unique challenges in lens design and manufacture. This Spotlight provides a tutorial on the key optical design considerations required for video endoscope systems. The text compares different types of endoscopes and discusses their advantages and disadvantages. Key areas of clinical importance to the medical industry are stressed. 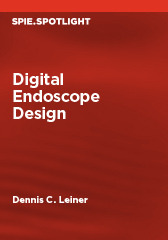 The book also presents endoscope specifications, international standards, and several design examples.